Visibility remains a huge challenge for CFOs in today’s dynamic and ever-evolving business environment. A study of more than 500 CFOs and senior finance executives conducted by the Economist Intelligence Unit (EIU) and commissioned by Coupa, reveals that more than 60 percent of CFOs lack complete visibility into the transactions within their organization. Sound familiar? 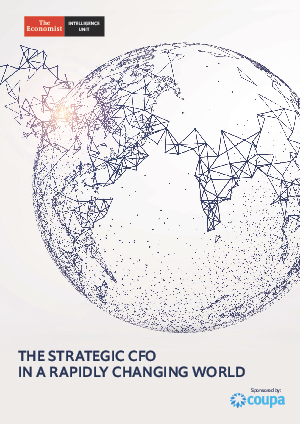 Read the report to learn how CFOs are responding in a rapidly evolving world where new technologies, uncertainty, and emerging threats abound. The report also includes five qualitative interviews with the CFOs from Ally Financial, Driftwood Acquisitions and Development, Hays, Micron Technologies, and Zendesk. Breaking down silos and improving cross-department collaboration is key. Nearly 60 percent who assess their organizations as most able to manage risk, cost, and capital are collaborative. Business performance risk is the number one threat with the potential to impact the financial position of those organizations surveyed.